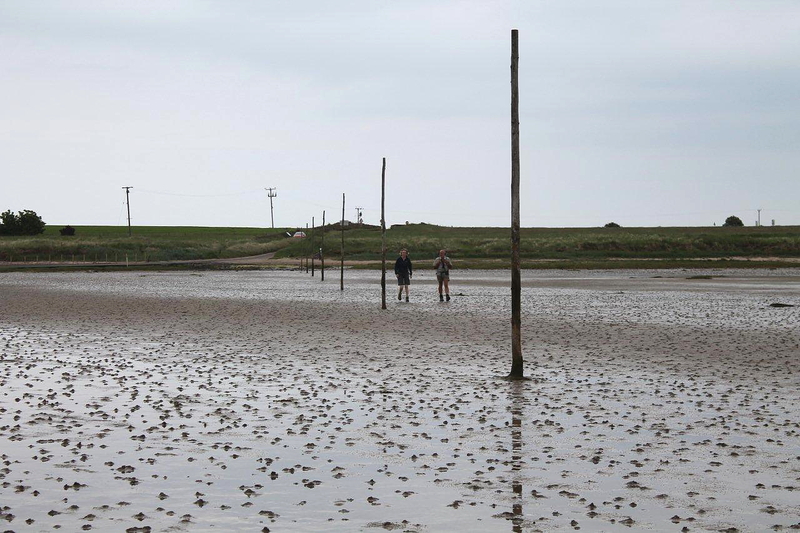 THERE are not many walks in Britain best undertaken barefoot – but crossing the two-and-a-half miles of mudflats to the island of Lindisfarne is one of them. It’s something I’ve always wanted to do and today I have the chance. 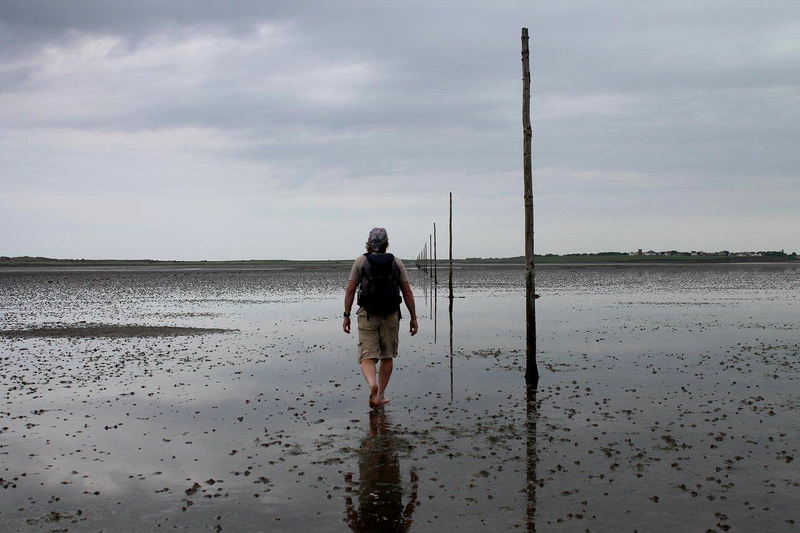 Not only is this a walk through mud, it’s a walk through turbulent history that transformed the English and their beliefs. And it comes with the added thrill that if you tarry too long or miscalculate the tides the North Sea will sweep in and claim you . . . 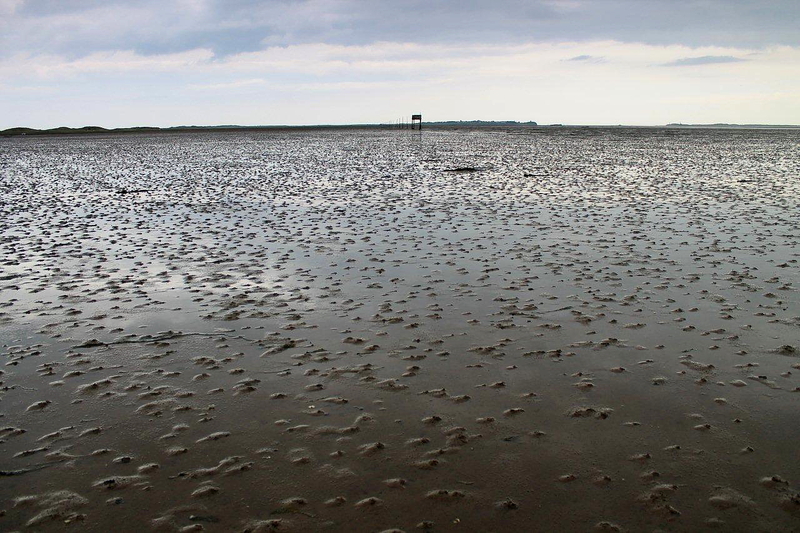 Some call it Lindisfarne, some Holy Island – but whatever its name, this small hump of sand, mud, earth and intrusive volcanic rock is a piece of Heaven on Earth just off the Northumberland coast. 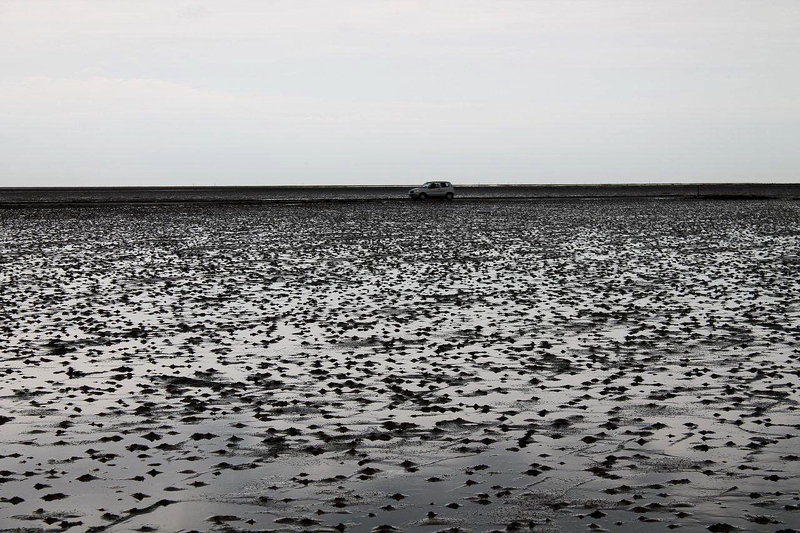 I’ve been visiting the island since the 1970s, but always by the conventional route – by car along the causeway at low tide. 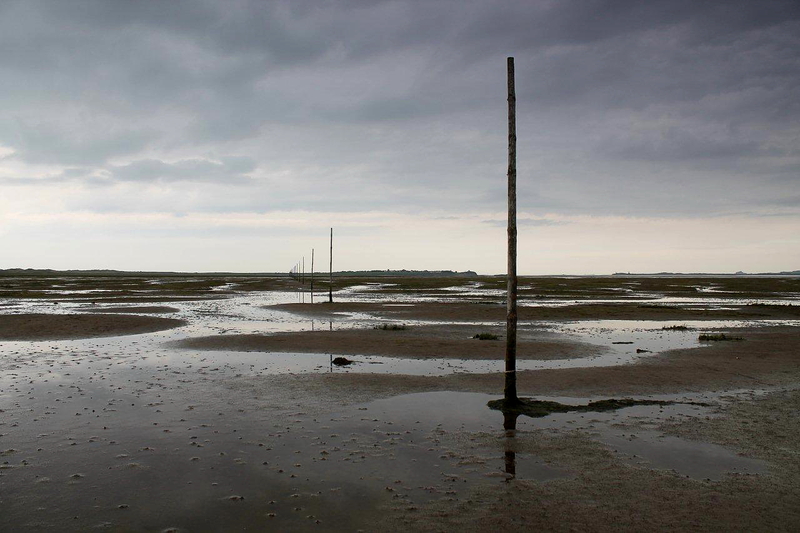 An unwavering line of posts marks the pilgrim’s route across the mudflats. 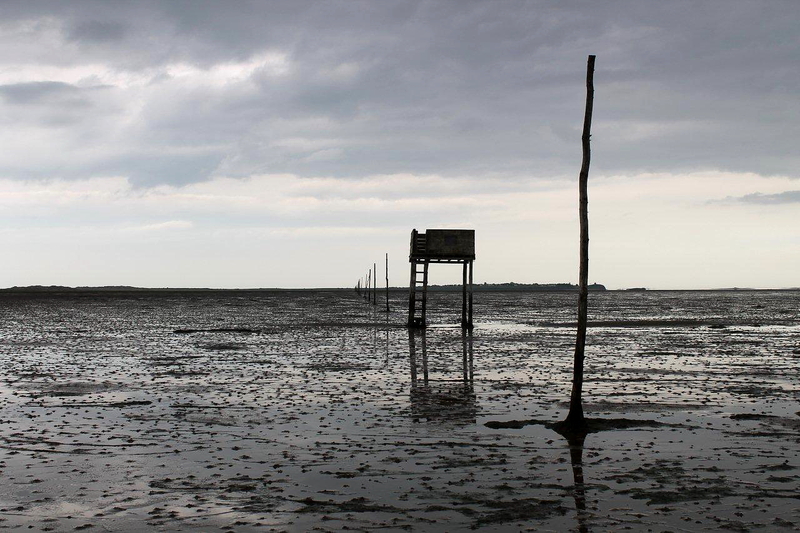 The route commences a short distance along the modern causeway close to a tiny refuge – basically a shed on stilts – erected for the salvation of motorists who gamble with fate and lose. From this refuge they can gaze across the incoming tide and reflect on their misfortune while their car disappears beneath the waves, and in the certain knowledge their plight will be recorded for posterity by all the local newspapers and featured on BBC1’s Look North the following day. So I stand on the tarmac in my bare feet while my car rumbles off across the causeway with my wife at the wheel and granddaughter waving happily from a window. 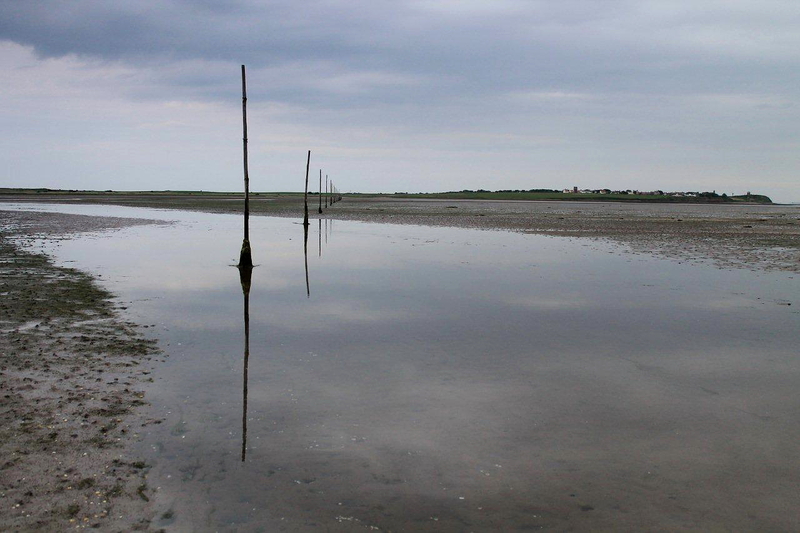 And I gaze at the line of posts disappearing into the vanishing point where the mudflats meet the sky, and at the rainclouds gathering as night approaches on a cool easterly wind. I missed the morning low tide, and now my watch says 7pm. It’s gloomy; the world is wide and empty; and the last thing I feel like being is a pilgrim. Oh well. He who would valiant be, ’gainst all disaster. As I clamber inelegantly from the causeway into the soft and strangely comforting mud I am reminded of a Roman Polanski film I watched many years ago called Cul-de-Sac. It was filmed entirely on Lindisfarne and starred Donald Pleasence as the neurotic owner of a clifftop castle held hostage with his flirtatious wife by a couple of desperate robbers whose getaway car has succumbed to the tides. It was one of those bleak, monochrome 1960s films with a bleak jazz soundtrack. I think the term is film noir. In fact, despite being a low-budget movie it did bleak on a Hollywood scale. It was almost as bleak as my surroundings tonight as I plod reluctantly into this vast mudness towards the first post. I decide I’m in one of those situations where a long-cherished idea – something you’ve always dreamt of doing with fondness and eager anticipation – turns out in reality to be something quite different to what you expected. I’d always imagined bright sun, blue skies and miles of golden sand on this adventure. I’ve got gathering night, rain showers, and mud stretching to the horizon. 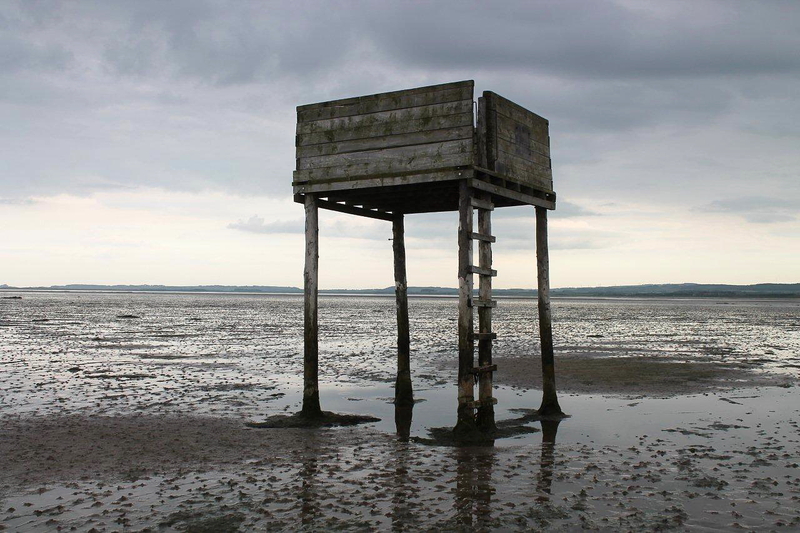 Within a few hundred metres I encounter a pilgrim’s shelter perched on stilts above the endless mudflats. This is similar to the shelter for motorists on the causeway only it does not possess a roof. I suppose the thinking is that pilgrims are hardy folk who do not require a roof when caught out by the tides. I can see where the authorities are coming from on this one but I don’t necessarily agree with the end result. Just because St Cuthbert used to spend his nights in meditation while immersed up to his neck in these waters doesn’t mean we are all keen to suffer such hardship. 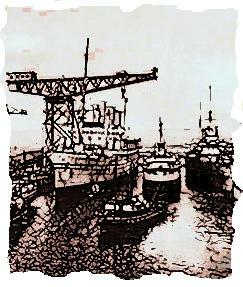 I plod onwards through soft brown mud and tidal streams that ripple around my ankles. The marker posts pass one by one, but still their endless line stretches to the vanishing point. Then, after a mile or so, I reach a section of the path that looks, from a distance, to be firm ground covered in a thin layer of grass. The marker posts cut straight across this greenness. But the grass is growing on filthy black mud – the type that smells and swallows feet. 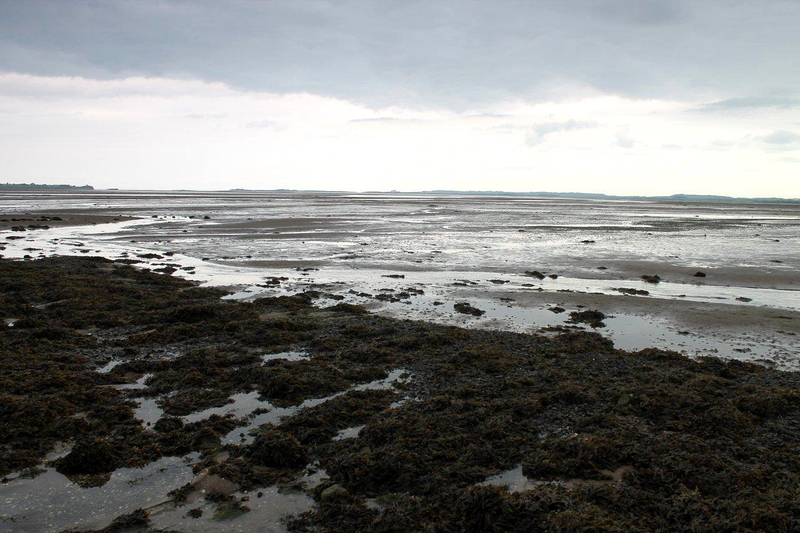 This is a suitable place to break off and dive into the history of Lindisfarne. So the monks set up their community. And in the early 7th Century, under the guidance of St Aidan, and with the blessing of Oswald, king of Northumbria – ruling from his nearby stronghold at Bamburgh – they spread the word of God among the heathen Anglish settlers and the pagan Picts to the north. And all went well. A welter of saints continued the works of Aidan – including Cuthbert, Eadfrith and Eadbehrt – the north of England rejoiced in its newfound faith, and miracles became so plentiful that even otters, ravens and porpoises flocked to hear the preaching of these evangelical people. It was the Golden Age of the North, the sun shone continuously and there were no clouds on the horizon. In this year fierce, foreboding omens came over the land of the Northumbrians, and the wretched people shook; there were excessive whirlwinds, lightning, and fiery dragons were seen flying in the sky. These signs were followed by great famine, and a little after those, that same year on 6th ides of January, the ravaging of wretched heathen people destroyed God’s church at Lindisfarne. Never before has such terror appeared in Britain as we have now suffered from a pagan race. The heathens poured out the blood of saints around the altar, and trampled on the bodies of saints in the temple of God, like dung in the streets. Despite these early raids, the monastery continued to flourish for the best part of a century. But in 866 an army of Danish Vikings captured York and established what has become known as the Danelaw – that large part of England ruled by Danes for many decades. 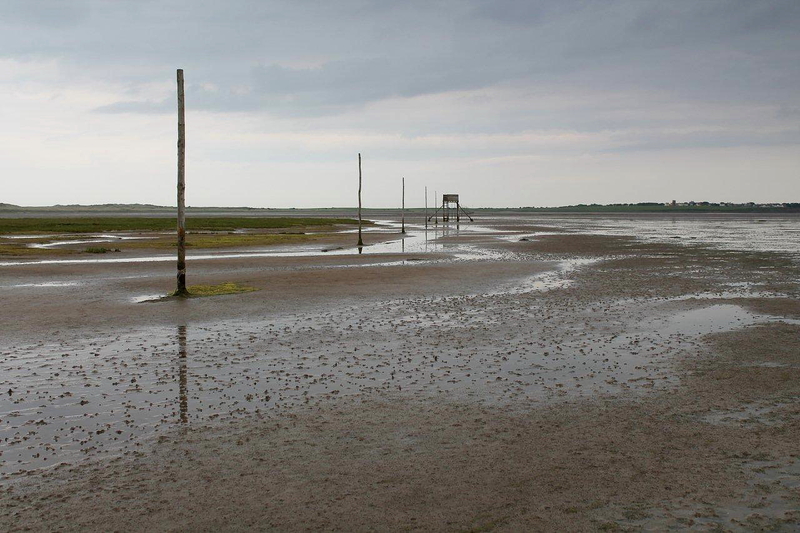 The Viking army pushed northwards into Northumbria in 873, and two years later the monks of Lindisfarne abandoned their settlement and fled to the mainland bearing the remains of St Cuthbert. St Cuthbert’s coffin was carried around the north of England for many years before finally being interred in Durham Cathedral. There is a general rule that states that if a northern village or town has a church dedicated to St Cuthbert, then this is a place his remains rested on their travels in their flight from the Vikings. From my front window in Barton, North Yorkshire, I can see St Cuthbert’s Cross, a scheduled monument which is little more than a finger of stone set upon slabs. St Cuthbert rested here in front of my house. If I’d been around in those days I’d have invited the monks inside and made tea. I leave the smelly black mud behind and enter the final mile of firmer brown mud, which is sprinkled with tiny shells that hurt the feet. I’m sure the monks would not have complained. They were hardy folk. Hardship was a way of life. There is an eerie sound out here on the mudflats. I’ve been aware of it since I left the causeway. At first I assumed it to be the continuous whine of trials bikes, perhaps half a dozen riders scrambling in the sand-dunes. But there are also higher pitches, reminiscent of winter winds in telephone wires, and the occasional guttural bark – or a moan that sounds uncannily human. I have heard old tales about sailors being lured onto rocks by the cries of the shipwrecked – and that’s what this noise sounds like. It’s human but not human. 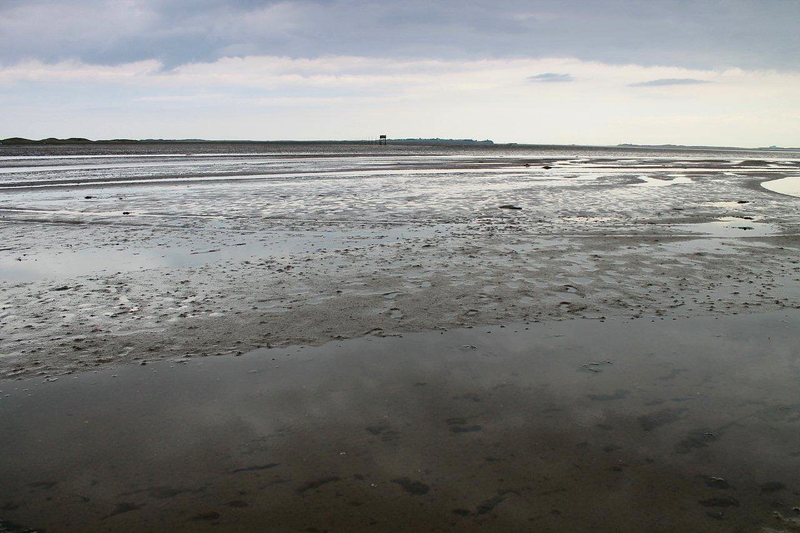 I gaze south across the mudflats, and about a mile distant spy a vast colony of seals. There must be several hundred of them in a long line. And they moan and bark and whine and whistle and grunt and scream and fill the evening air with the most unearthly racket. 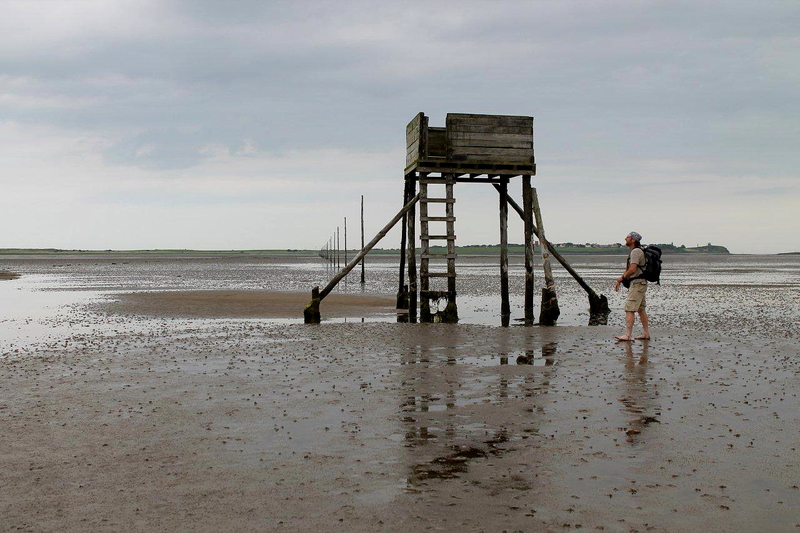 Approaching the firmness of Lindisfarne I meet two walkers heading for the mainland along the pilgrim’s path. They tell me they made the crossing before the morning tide, spent the day on the island, and are now returning to their vehicle. That’s a pleasant way to spend a day. We pilgrims haven’t lost the knack of self-entertainment. Reluctant to spoil the ambience of my walk by pulling on my trainers, I limp up the road to the Lindisfarne car park in my bare feet. I must admit, this is more bravado than homage to the original occupants. But, as John Major said, where there’s no pain there’s no gain. If you fancy having a crack at this walk, and I thoroughly recommend it as something different if you’re in the area, it takes about an hour. 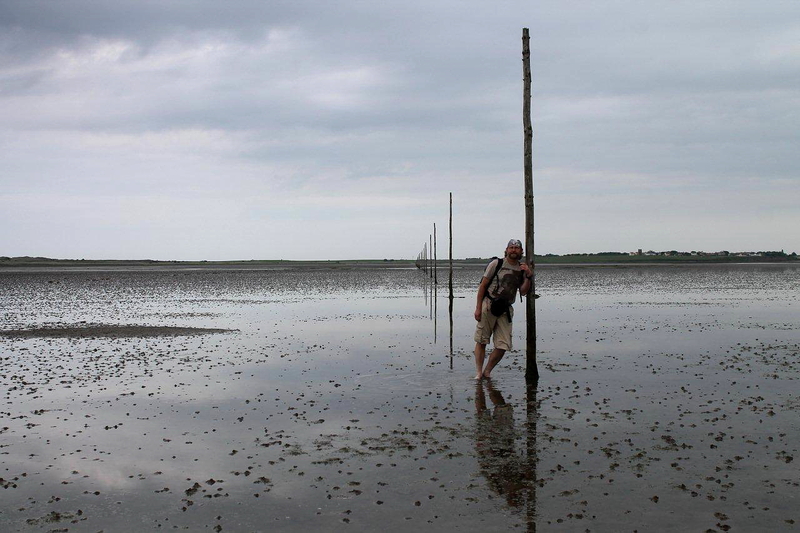 There is plenty of time between tides, and with the posts to follow, direction finding is no problem. 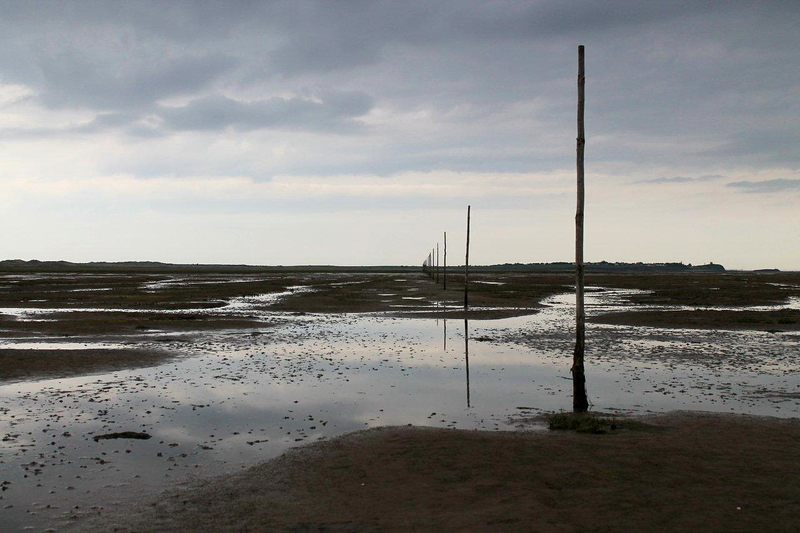 The pilgrim’s route to Lindisfarne is more than just a walk – it’s a journey through a history that links the best and the worst of human endeavours to the splendours of the natural world. It’s an experience. Oh, and the Christians returned to Lindisfarne after the Norman Conquest and erected a priory which survived until the Dissolution. Then in recent years another bunch of pirates called English Heritage moved in and now charge the public £5.40 to gaze at ruins. Children as young as five are charged £3.20. I’m not sure what St Cuthbert would have thought about that. I expect he would have immersed himself up to his neck in the North Sea and not come out again. 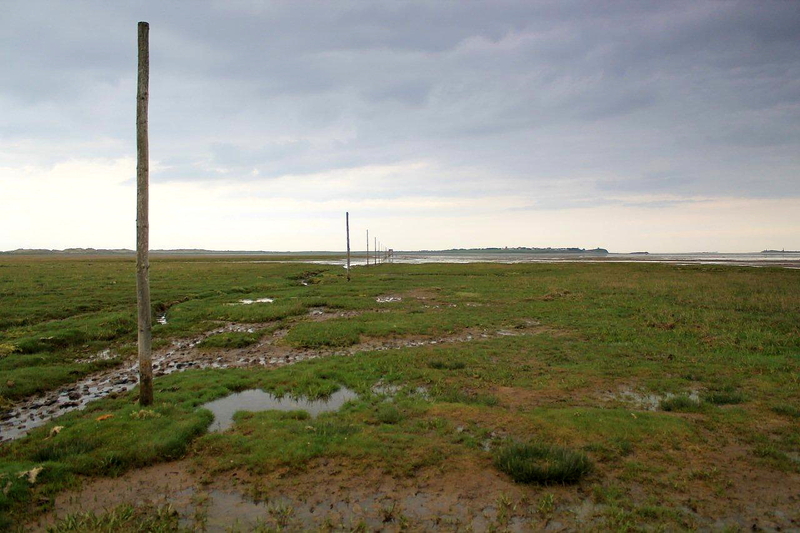 RICHARD W Hardwick’s blog St Cuthbert’s Final Journey follows the route taken by the Lindisfarne monks in their flight from the Vikings around northern England and southern Scotland. With words by Richard, Durham University’s writer in residence, and pictures by award-winning photographer Paul Alexander Knox, it’s a thoroughly enjoyable and enlightening read. TIDE and time wait for no man – and no woman either. 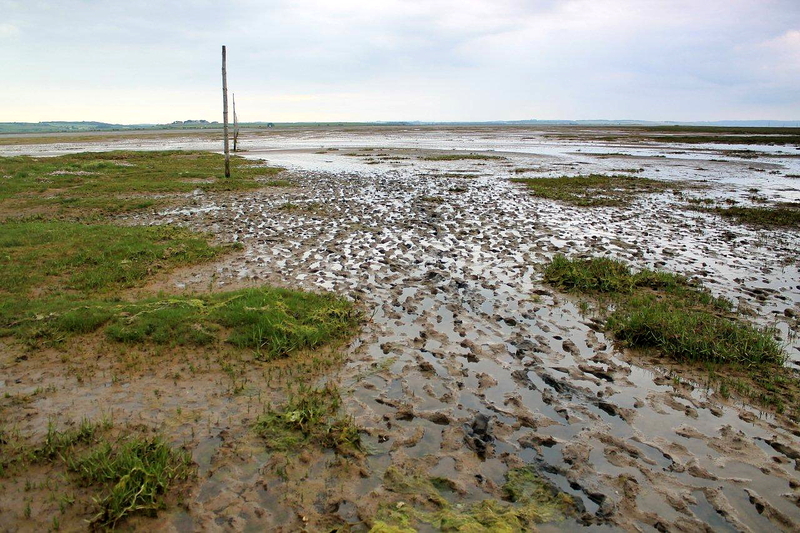 Mudflats and estuaries are dangerous places. 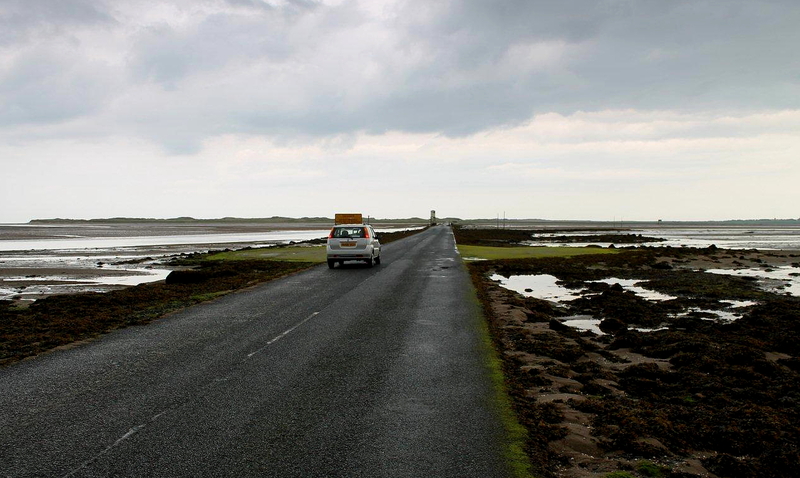 Check out the safe Lindisfarne crossing times, courtesy of Northumberland County Council, here. This entry was posted in Archaeology, Environment, Footpaths, Hiking, History, Legends, Life, Religion, Ruins, Shipping Forecast, Vikings, Walking, Weather, York and tagged outdoors, Scotland, transportation, WPLongform. Bookmark the permalink. Hi Mart. Thanks for that. Yes, one sunny day. 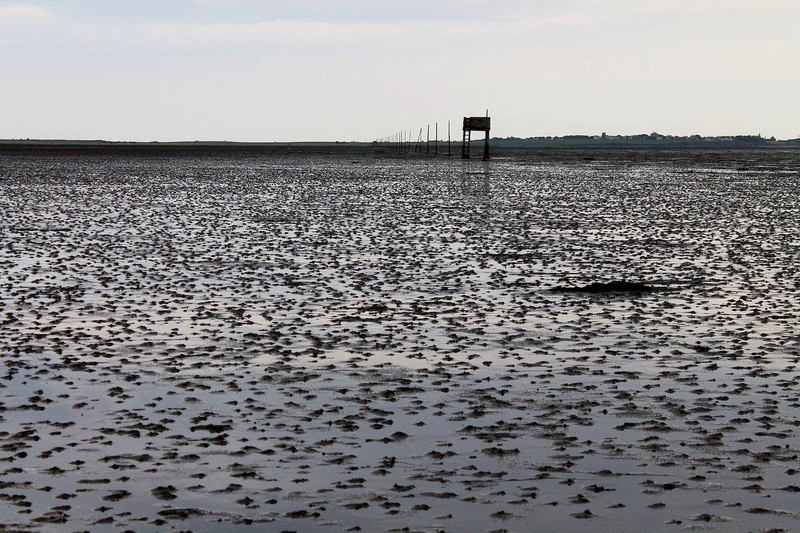 I’ve been keen to get to Lindisfarne for some time, but seeing those muddy feet, it may be the car route for me! Thanks for the great post! Ha ha. It’s still a great trip by car. It’s a wonderful place. Hi Peter. Wellies would have been a good idea. And unlike Corrour – no midges! I actually paid to go inside Tynemouth priory once and had a conversation with one of the English Heritage guys about the wild cabbages growing on the cliffs. I was very impressed. But I’m easy to impress. There is an eerie sound out here on the mudflats. Exactly. I didn’t realise until writing this stuff that the watered down hymn we sang at school bore little resemblance to Bunyan’s original. Can’t stop whistling the bloody thing now, Danny. Lovely idea, but personally, I’d wear something on my feet – beware of weever fish. Not nice things to stand on! I’ve just looked up weever fish. That’s my barefoot paddling days over, Richard. Danny, I shall never, ever venture into water again. There’s a lot of scary stuff out there – and I just hope it stays OUT there. I enjoyed that Alen. I love the mournful sound of seals singing (at least it sounds like singing to me) and enjoy coastal walking as much as the mountains nowadays. I have a fancy to do St Cuthbert’s way at some stage and a walk along your route at the end seems mandatory to keep in the spirit of such a walk. Hi David. I’d never heard seals make a noise before, except for the occasional oink on the telly when someone throws them a fish. Even on a boat trip out to the Farne Islands you don’t hear anything because they are obviously conscious of intruders. When I realised what the noise was the other night, and I saw several hundred of them way out across the sands, I was absolutely amazed. I wish I’d had a telephoto lens with me. The official final stage of St Cuthbert’s Way is a bit of a cop out because it follows the road, but for obvious reasons I can see why that’s so. 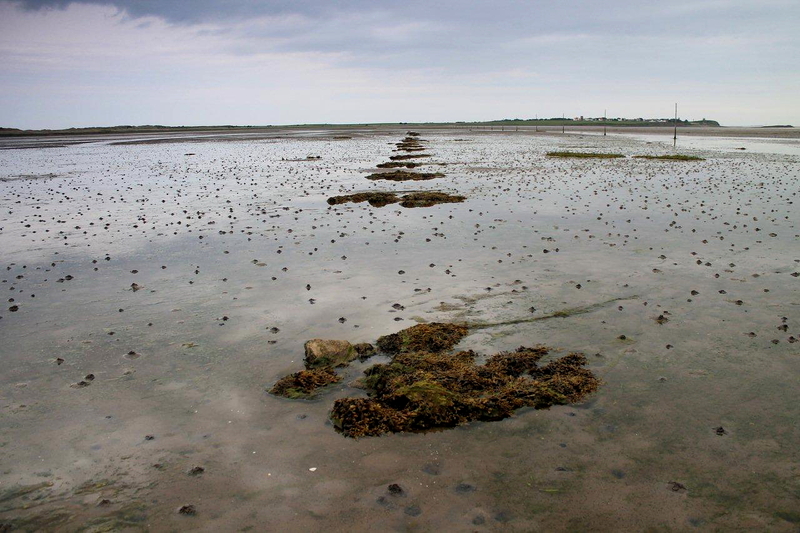 I found the path across the mudflats thoroughly enjoyable and you will too. Fantastic! I was there about 2 or 3 weeks ago with my Mrs. We took the traditional route by car (I would have liked to have walked it but she wasn’t up for it). I wondered what those boxes on stilts were, now I know! It is a magical place, but was very foggy when we went and we didn’t see much. A return trip is planned…but probably by car again. Hi James. Interesting you should mention the fog because the day after I did the walk it rolled in again. We’ve been caught out several times over the years by the coastal fog in that region. Apparently it’s called a haar and is peculiar to the coasts of south-east Scotland and north-east England. There’s a scientific explanation on Wikipedia but I didn’t understand it because it’s turned midnight and I’ve had too much wine. Lindisfarne on a clear day is the most perfect place in the world. A good trick is to time your crossing just before the tide comes in and spend the few hours of high tide on the island. This is when it’s at its most peaceful and you’ve stacks of time to do what you want before you drive off home again. The northern coast is superb. Thanks for the advice Alen. My first trip up that way since I was a kid…the weather was poor but as I said I’ll be going again soon. Looking forward to exploring this magical place. 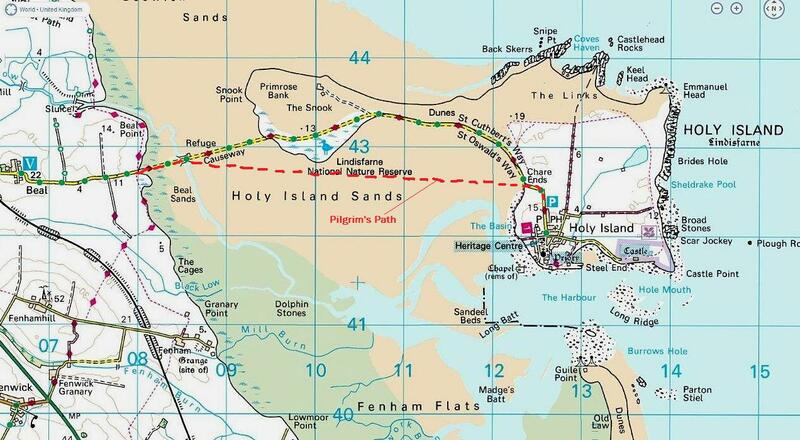 I’ve been across with my parents by car but had no idea there was a walk across it – no quicksands presumably like Morecambe Bay? Carol, it’s nearly 3am and you are up far too late and so am I. I only stayed up because the laptop decided to update itself. There are no quicksands only soft brown mud and softer black mud that stinks a bit. So no worries there. I was supposed to be doing the Morecambe Bay walk with a mate of mine who was going to send me a date, but I think he’s forgot. There’s no hurry. Morecambe Bay isn’t going to go away. PS My email notifications of the blogs I follow has suddenly decided to delete every notification it sends. I shall catch up on your posts, and everyone else’s, as soon as I’ve sorted it out. My mate, Pete, was going to get hold of some dates of guided walks because a guide is essential. I think the cross-bay walks are quite regular occurances because loads of people do it for charity. But our arrangement was made about 18 months ago and I haven’t heard from him since. I’ll drop him a line sometime, then if you and Richard fancy coming along then the more the merrrier. Safety in numbers and all that. The cross Morecambe bay walk is just the one guide I think – the guy who’s done it for 50 years now. He usually has a group of a few hundred I think – won’t be quiet. If you manage to get him on a quieter day and I’m not working, I’d be very pleased to come. I quite liked the shiny black feet, Loty. It was very therapeutic. Bad haar day. Hmmmmm . . . I’ll let you off with that one for now, Jo. There is no fresh water for washing feet at the end of the path. But there are some nice clean pools and tidal runnels which wash everything off. But I got that black stuff all over my shorts as well so it’s advisable to wear old clothes. You do right not to watch the video Danny posted. Just remember that if you ever go swimming in the Amazon, don’t pee in the water. I won’t be doing either. An inflatable paddling pool in the backyard is my limit from now on. I like the roofless shelter theory. I think you might have something there, Jo. Sorry it’s Peter again.For Welles read Wellies. (Remind me to tell you about the Admiralty Gunnery Manual and it’s erratum slip.pip pip! I read it as Wellies, Peter, and I wouldn’t have known any different if you hadn’t pointed it out. I think you’re going to have to tell me about the Admiralty Gunnery Manual. It’s an interesting story and the pictures are great, Alen. Have you figured out what creates the eerie sound? And the black mud do you know why it smells and why it is black. It looks like oil. Hej Hanna. The eerie sound was made by the seals. There were hundreds of them. The post perhaps does not make that clear because I deleted a paragraph. I’ll amend it. The black mud is rich in sulphides and plays host to complex microbial communities. There is also a lot off decaying organic matter. Sulphides plus decaying organic matter must create the unpleasant odour, I imagine. Following in the footsteps of pilgrims. Makes for good reflection doesn’t it. I’ve tramped about in marsh lands of black ooze a bit but never for a couple miles and never with guide posts. I was lost, but now I’m found. Thanks for the history Alen. Dohn, perhaps we’re all pilgrims of one kind or another. I shall reflect on that on my next walk. It is a remarkable place. Certainly is, John. Cheers, now. Tracey, be fully tempted. I felt a bit apprehensive about it but it was great and I’d do it again any time. Just watch out for the weever fish. Hi Mark. I always maintain that a bloke who can take pictures of his feet does not have weight problem and can therefore justify supping a few pints after a walk. Years since I`ve been there alas. Must go back,thanks Alen ! Hi Alex. Good to hear from you. Hi Alen. This seems` like just the walk for me, at my age the likes of Blencathra are a memory of a walk. This is nice and flat just right for a 66 year old crock. Best wishes, Phil. In Middlesbrough. Hi Phil. It’s a great walk with no hills at all. Just flatness and perfect peace. Oh, and a bit of mud. Hi Andrew. Thanks for that. I thought the noise was spooky enough in the late afternoon and evening – but it must be even more so at midnight. It took me a while to realise what it was. I thought at first it was lads on trials bikes in the sand dunes somewhere, then when I got nearer and the noise got louder I spotted the seals out on the sands. I must go back. Today would have been perfect, with frost on the ground and a bright blue sky. Thanks for your account, and the pictures! We’re about to cross tomorrow and it’s very useful to read your experiences first. When you said it takes about an hour, is that one way, or there and back? Hi Anita. That’s one way. I’m sure you’ll enjoy the experience. Have a great day. We did indeed enjoy it. Thanks for the warning about the black mud though! For others concerned about the mud / whether to go barefoot: I chose to go barefoot from the first water pool, meanwhile my dad stuck to his boots and ended up regretting it when the salty water soaked them through early on. 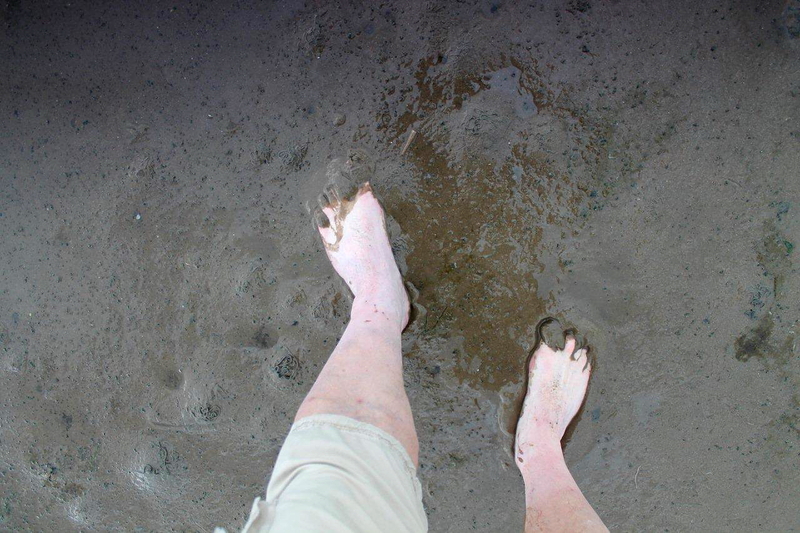 Here is a picture of the muddiest my feet got – https://goo.gl/photos/Y4pNKU7k6HnqbbrJ6 – but I was able to wash it off completely in the last water pool before carefully replacing my boots which were still nice and dry, unlike my dads! I agree that wellie boots would probably be the best option if you have them & don’t want to go barefoot. Great stuff. I knew you’d enjoy it. I hope your dad’s boots recover okay – with all that salt in them they might last a couple of years longer. Does anyone know how many wooden posts there are please ? Can’t help you there. My only comment would be “enough”. Lol ! Thanks for the response. We have been but there’s too much going on to found posts and I cannot find reference to numbers on the net !